Forest friendly timber is sourced in an environmentally sustainable manner. This article provides some information about various timbers available to enable readers to choose environmentally friendly materials suitable for their needs. 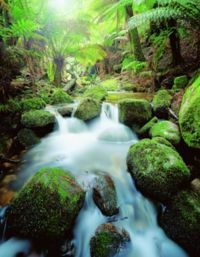 The use of rainforest and native forest timbers (such as old growth forests) in Australia and around the world is contributing to the destruction of these forests and the habitat they provide. The only really safe option is to use of plantation grown or recycled timbers. Talking to your timber supplier about your building needs and concern as to the origin of the timber can make a difference to the environment. Timber can be an environmentally friendly building material that is both renewable and reusable. Unlike other building materials such as concrete and steel, timber only requires only land, water, nutrients and sunlight to grow. The development of an ecologically sustainable timber industry is necessary to ensure timber resources are available for future needs. This is why you need to purchase "good wood". timber that has not led to habitat destruction. The Australian saw milling industry supplies about 70% of domestic demand for timber, mostly from the plantation sector. The rest is primarily made up by softwoods from North America and New Zealand, and rainforest hardwoods from South East Asia. Unfortunately, a lot of domestic and imported timbers are sourced from forests that are not managed in a ecologically sustainable way. This is why you should ask where your timber was grown and to insist on timbers that are good woods. About 13% of Australia's sawn timber is sourced from tropical forests. We also import tropical rainforest timber items such as veneers, plywoods and picture mouldings. The majority of these timber products are sourced from unsustainably logged forests and could be replaced by sustainable locally grown alternatives. Logging tropical rainforests causes the extinction of hundreds of plant and animal species each year in addition to loss of the home of many indigenous tribal peoples. In South East Asian rainforests the rate of clearing is five million hectares per year. Once an intact rainforest has been destroyed, it cannot be replaced for thousands of years. Note that some suppliers state that they have Forest Stewardship Council (FSC) certification for some timber products. While considerable effort has gone into attempting to provide FSC certification for ecologically sustainable timber production, some doubts have been raised both in Australia and overseas about the effectiveness of this scheme. The only really safe option is recycled or plantation sourced timber. Old-growth forests are native forests which have had no recent disturbance by humans and regenerate naturally over hundreds of years. Like rainforest, old growth forests provide vital habitats for many species of flora and fauna. These forests are becoming increasingly rare both overseas and in Australia. Consequently we recommend that you avoid timbers sourced from old growth forests. The issue of which Australian timber species to recommend raises a number of questions that are hotly debated. On the one hand, industry generally believes that there is no problem with logging native forests, while environmental groups advocate the boycott of timbers that are not grown in plantations or recycled. Generally, we recommend that you use plantation and recycled timbers. However, we acknowledge that it is important to recognise and support timber from other sources such as hardwood forests, farm forests, urban forests and properly managed native restoration forests, as these sources of timber will play an increasing role in the future for the supply of our domestic timber needs. Plantation softwood such as radiata pine and the tropical native hoop pine cover about one million hectares in Australia and produce almost half of all the sawlogs. Plantation pine is suitable for most housing needs. Treated pine is superior in quality and less expensive than many of the native hardwoods, and is available in commercial quantities. Plantation hardwoods comprise much less crop area than softwoods. Timber from native forests supply the majority of the domestic hardwood market although most is used for woodchips. Governments and private landholders are increasing their quantities of plantation hardwoods for timber, although it will be a number of years until there is a commercial quantity available for sawlog use. Is plantation softwood a better option? Where did the timber come from? How can I minimise the amount of timber I use? Some retailers will be unable to tell you whether a timber is sourced from native forests or a plantation. If they don't know, you may wish to consider another supplier. If you need larger beams, we recommend engineered laminated pine beams. They are usually made from plantation-grown offcuts and are stronger than most hardwoods. These applications use the greatest quantity of timber in most domestic buildings. By using good wood for these purposes you will be minimising your impact on the environment.